Black Panther's Super Bowl 2018 commercial has made its debut online a few weeks ahead of the big game. The extended Lexus spot will air during a third quarter commercial break and it features some intense action taken from the movie along with some new clips that were shot specifically for the commercial. Strangely, the commercial features music from Run the Jewels as opposed to Kendrick Lamar, who is curating the soundtrack. The track, "Legend Has It," has been used in previous TV spots for Black Panther and could end up on the final soundtrack. Speaking of Kendrick Lamar, another new TV spot has been released for Black Panther that features a snippet of a new, unreleased song from the soundtrack. The Black Panther Lexus commercial for Super Bowl 2018 features T'Challa, Okoye, and Shuri in some pretty intense driving. The 1-minute spot, called Long Live the King, is directed by famed music video director Samuel Bayer. 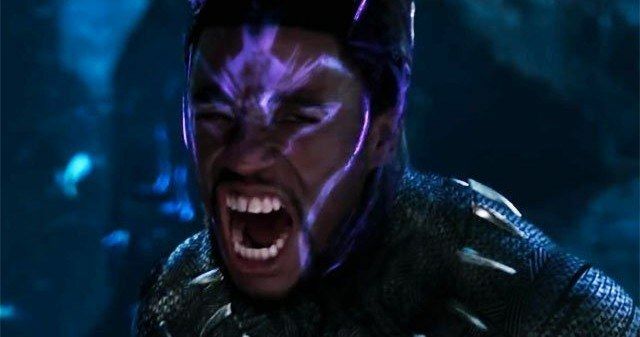 In the commercial, T'Challa needs to recover some vibranium, which is the precious metal from Wakanda. T'Challa (Chadwick Boseman), Okoye (Danai Gurira), and Shuri (Letitia Wright) are seen driving the 2018 Lexus LS 500 F Sport in the extended version of the commercial. A 30-second version of the ad will run during Super Bowl 2018 on February 4th. Lexus plans to market the 2018 LS 500 F Sport to a younger audience in the 40 to 55-year old range who might be interested in the car after watching the King of Wakanda tear around the city in it. Cooper Erickson, the vice president of marketing for Lexus indicates that many Marvel fans are "affluent" and estimates that the fans will be able to afford the car, which starts at the price of $75,000 and goes up to nearly $100,000. The car goes on sale in February when Black Panther hits theaters. Another TV spot for Black Panther was also released today with a focus on Michael B. Jordan's Erik "Killmonger" Stevens character and his approach to the villain in the movie. Fans listening closely enough were treated to about 30-seconds of a new Kendrick Lamar song from the soundtrack. It isn't clear what the song is at this time, but it could be a tease for the recently announced collaboration between Lamar and the Weekend. There's only a tiny snippet of vocals, but it's very much Kendrick Lamar and it has a cinematic feel to the beat with pulsing symphonic strings and natural percussion. Black Panther is tracking to be a monster at the box office and these two new TV spots are a welcome addition to keep fans satisfied in the short wait until the movie comes out. Black Panther hits theaters on February 16th, while the 2018 Lexus LS 500 F Sport will be available sometime before then for those with the deep pockets. You can check out both new commercials, one featuring the extended Super Bowl 2018 spot and the new TV spot featuring the unreleased Kendrick Lamar song below, courtesy of Lexus Vehicles' YouTube channel.